We can all understand the differences between people in terms of their age, gender, appearance, and cultural backgrounds, but we often fail to grasp the idea that we don’t all sense, process and judge things in the same way. How else can we explain the obvious truth in George Carlin’s observation that “anybody driving slower than you is an idiot, and anyone driving faster is a maniac”? Tools such as the Myers-Briggs Type Indicator (MBTI) give us a start in thinking about this. MBTI profiles chart what energizes us, how we learn, what factors are crucial in our decision making, and what coping mechanisms we use to deal with the world we face. But it requires its users to answer a structured set of questions to assess themselves, which gives us no insight into how we relate to others or how they see us. The Johari Window, on the other hand, uses other people’s assessments of its users, which makes it useful for gaining such an insight. To use the Johari Window, you review 56 adjectives and select the six that you believe embody your character. You then invite others to select the six that they think best describe you. Putting the responses together generates your own, personalized Johari Window. The top-left quadrant (known as the Open Area) contains the attributes both you and at least one other person selected. (If more than one person selected that word, the total number is listed.) This quadrant reflects what you know about yourself and what others know about you. The top-right quadrant (the Blind Area) is what others say about you that you did not say about yourself. The bottom-left quadrant (the Hidden Area) is what you said about yourself but was not attributed to you by others. Finally, the bottom-right quadrant (the Unknown Area) contains the attributes that no one chose. This is either because you don’t have them or no one knows that you do have them. 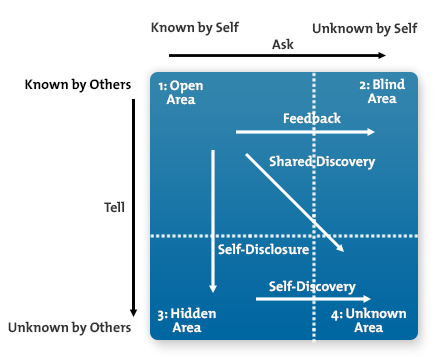 You can build your own Johari Window from scratch, but Kevan Davis offers a free model. You can do your self-assessment and then send his hyperlink to other people, allowing them to select the attributes they see in you. The unique value of the Johari Window comes from having other people’s perspectives. This can reveal biases and filters that keep us from seeing who we really are. If there are surprises, we’ve learned something. If there are no surprises, our self-image is validated. I will now offer a critique and some different ways that we can use the Johari Window. This brings up an important point when you seek other people’s feedback to build your Window. You should give them permission to be critical by explaining that your intent is to get a complete and accurate picture of yourself – strengths, weaknesses and all. Without this, it’s likely that your family, friends and co-workers will be unwilling to risk upsetting you. It may also be helpful to build two Windows – one for those who know you well and another for those who don’t. This latter group may include workers in another department, roommates of friends, or perhaps your in-laws. They know who you are and have probably come to some conclusions about you, but they have not spent much time with you in revealing circumstances. From these people, you gain insight about the first impressions you make. These may or may not be consistent with what your friends say about you, but it’s good to know what kind of vibe you give off to strangers. Johari Windows are also great team-building tools. Work with your team to review one another’s Windows. Trust builds as you expand Open Areas and shrink Hidden Areas together. These discussions require reciprocity so, when you talk, do not dominate the conversation; be an active listener by paying close attention to what you see and hear in response. Self-disclosure can be tricky, and it will help to grasp its dimensions. Start by covering a range of topics and stick to facts instead of opinions and emotions. This keeps things safe until you find common interests, and the conversation can flow deeper. Use good active listening skills to know when it’s okay to express strong emotions or intimate details. These can elicit painful memories, embarrassment or resentment, so respect the fact that people may prefer to keep things private. Cultural factors frequently play a role. Western cultures tend to reward self-disclosure; many Eastern cultures find it rude and disrespectful. Power imbalances can also be influential, with less powerful people feeling compelled to conform to the expectations set by the more powerful. Handle self-disclosure sensitively and it will lead to great leaps in trust. The Johari Window is an easy-to-use tool that helps people learn who they are with the help of other people’s perceptions of them. When they are shared, these Windows build knowledge, understanding and trust between people who are just getting to know one another. HI. I am a Trainer by profession but learner by heart .My area of interest are Human Behaviour ,Leadership and self actualization,Lets share our learning and grow as human being.